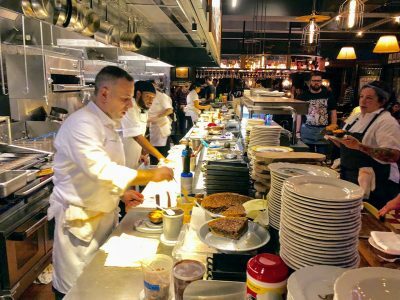 St. Anselm has only been open a few weeks but it’s already made my short list of best new restaurants of 2018. I can’t say I’m surprised. 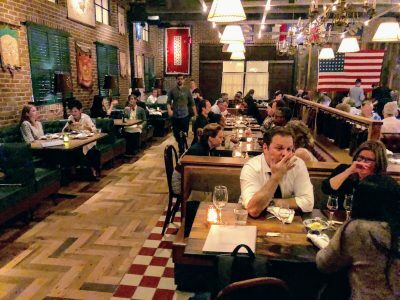 It’s a joint venture between restaurateurs Joe Carroll, who own the original St. Anselm in Brooklyn, and the prolific Stephen Starr, who owns Le Diplomate in DC and 36 other restaurants (mostly in Philadelphia). 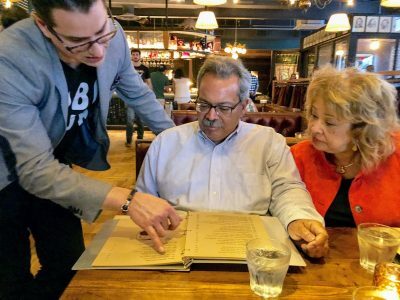 No one, other than maybe Danny Meyer, can match Starr’s ability to produce consistently winning combinations of food, atmosphere and customer service over such an extended period of time. Walk by Le Diplomate any evening and you’ll see what I mean; it hasn’t lost a step in quality or buzz in the five years it’s been open. In today’s vernacular, Starr knows how to scale hospitality. When Starr hired local star Marjorie Meek-Bradley (Ripple, Top Chef) as St. Anselm’s head chef, it clinched the deal. It’s like hearing that a new Mary Poppins movie is coming out and then finding out Emily Blunt, Lin-Manuel Miranda and Meryl Streep are playing the leads. It won’t be out until December and I’m already in the tank. 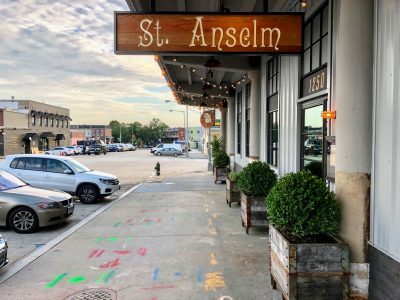 Unlike Le Diplomate, St. Anselm defies easy categorization. Le Diplomate is a French bistro. Its interior meticulously replicates the Parisian bistro of your dreams and the food is classic French. I don’t quite know what St. Anselm is. 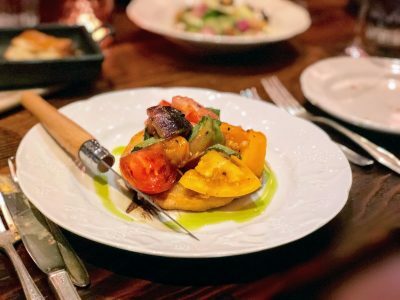 It most closely resembles to a steak house but there are lots of menu options that you wouldn’t see at a Morton’s or Ruth’s Chris, as well as a lighter, more seasonal, hand in the kitchen. Call it a meat-centric, farm-to-table grill. My wife thinks the room feels like a secret society. As it turns out, she’s pretty close. One the managers says it’s “an homage to fraternal organizations.” I’m not sure what that means but no sense overthinking it. It works. 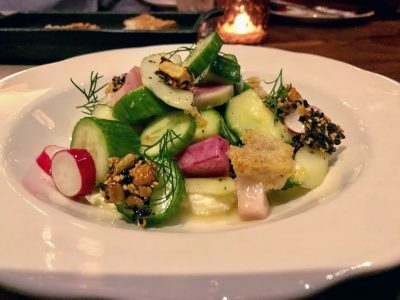 Like Le Diplomate, the space feels comfortable and lived-in even though it’s brand new. Chef Marjorie Meek-Bradley at the pass, checking every plate leaving the kitchen. I don’t know if this staffing can be sustained but there are ten cooks behind the counter the night I was there, prepping, grilling, plating and passing plates to Chef Meek-Bradley for inspection. There were also multiple managers on duty and plenty of servers, bussers and hosts. You’ll feel well taken care of and appreciated, certainly based on the sheer number of people who’ll thank you for coming on the way out. Speaking of service, Segelbaum is the Wine Director for all 38 Starr restaurants. He’s there to help with the opening and will walk you through a decision tree on the wine list that’s as detailed as you can tolerate. Do you like your wines fruity or earthy? If fruity, what kind of fruit — red fruit like cherries and strawberries or darker fruit like currants and raisins? I bailed out when he was trying to explain a particular wine and asked us to imagine a lighter Montepulciano that was starting to gain some age. Still, I appreciate the passion. So if debating the minerality of various Terroirs is your thing, go now before Segelbaum moves on. Get these crisp-edged, flaky biscuits as your bread basket. 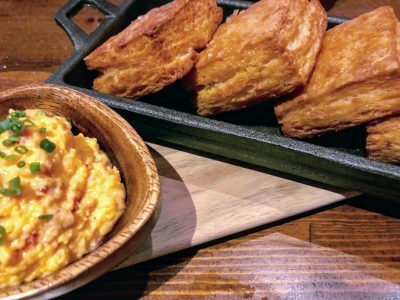 If you don’t finish the freshly-made pimento cheese before the biscuits are gone, they’ll bring you more. A nice, very Starr-like, touch. 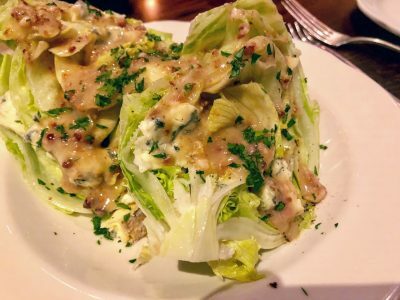 A classy take on the familiar iceberg wedge. The warm, smoky bacon dressing pairs nicely with the buttery Forme d’ambert, one of France’s oldest blue cheeses. A cool and refreshing combo chock-full of cukes, radishes and my current favorite salad ingredient, celery. The cashew granola contains not only cashews but sesame seeds and a little espelette pepper for heat. A terrific end-of-summer tomato salad that will probably be off the menu by the time you read this. The tomatoes don’t need much help and Meek-Bradley lets them shine. The fry bread provides nice temperature and textural contrast. These plump Rappahannock beauts are just cooked through and still juicy. They’re perfect for people, like me, who like the taste of oysters but are turned off by the phlegminess of raw. 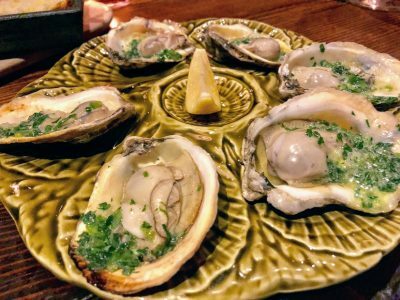 The garlic and herb butter add just enough oomph without overpowering the oysters. A big, fatty lollipop of deliciousness. 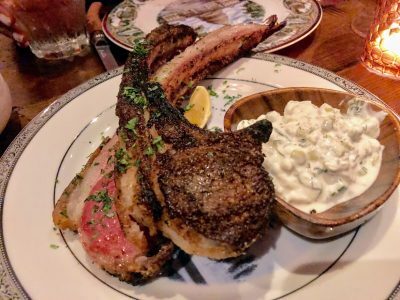 Go with someone you love so you can gnaw on the bone and get the delectable hard-to-reach bits. Warning: the Ax Handle ribeyes are sold by weight ($2.95 per ounce), which doesn’t sound like a lot but can get pricey. This steak clocked in at almost $150. While it can comfortably serve two, it’s still an investment. 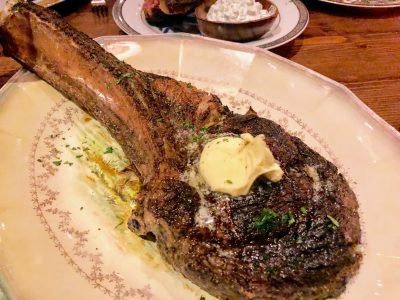 There are less expensive cuts on the menu, like the flat iron for $24 and the butcher’s steak — aka hanger steak — for $28. This is not your typical rack of lamb with little Frenched bones. These bones, like the Ax Handle, are meant for gnawing. The lamby, salty meat is seasoned with baharat, a Middle-Eastern spice mixture that perfumes the chops with cumin, coriander, paprika, cinnamon and cloves. 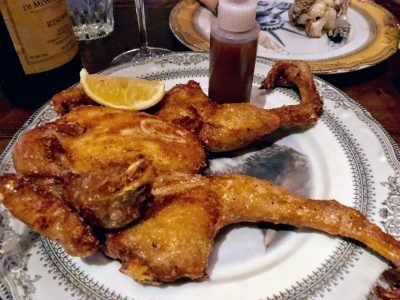 This young chicken is served “Buddhist style” with its head and feet intact. Visually arresting with its head tucked in and its knees splayed out in an unnatural position like RG III going down in a heap against the Seahawks. This is not one of those behemoth birds churned out by factory farms; it’s a smallish, young bird that never saw a hormone in its life. And it’s nicely cooked, with crisp, well-seasoned skin and moist meat. A very good version of the now-ubiquitous cauliflower. While the whole head doesn’t create as many opportunities for browning as cauliflower pieces, it makes for a dramatic presentation. 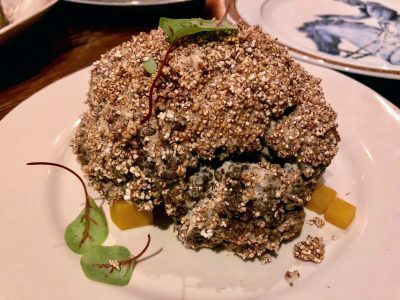 The tahini and amaranth provide nuttiness and the carpet of pickled golden beets add a welcome acid punch. Individual hand-crushing gives these potatoes craggy edges that crisp nicely. The delicious beefiness reminds you of just how much we as a nation have lost since 1990 when McDonald’s stopped cooking its fries in beef fat and switched to vegetable oil. When Andrew Cuomo said America was never great, he was obviously forgetting about McDonald’s fries. 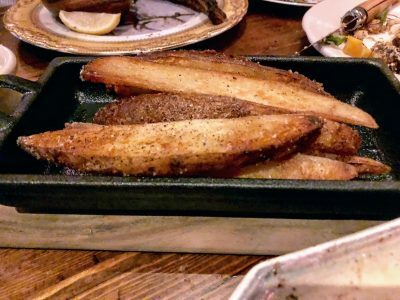 I’m not usually a fan of thick-cut fries, but these are excellent. Crisp and salty exterior gives way to a fluffy interior. Ranch dressing dipping sauce adds a nice sour-creamy touch. 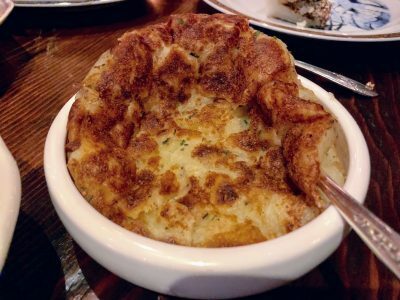 Not bad, but these pan-fried mashed potatoes come in third in the three-potato race. Sort of reminiscent of a twice-baked potato filling with rosemary. 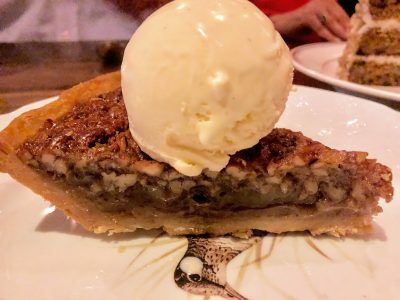 St. Anselm has good, solid desserts like this pecan pie. A lot of restaurants would feel the need to deconstruct a classic like this into some bizarre moonscape that reflects little understanding of what made the original so appealing. This version gets it right — a layer of crisp pecans topping a gooey layer of buttery, caramel-y filling, and a classic crust. Oh, and a scoop of vanilla ice cream. Done. Another example of a classic done right. Moist cake with just enough dried fruit, nuts and frosting to add interest without getting in the way. I stole a couple of bites from my table mate, but I may order my own next time. 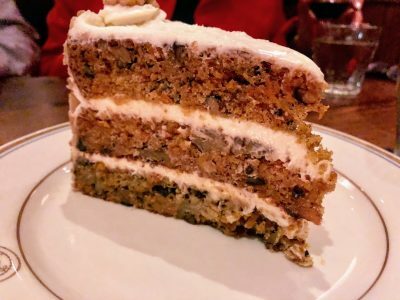 That’ll bring the number of times I’ve ordered carrot cake in a restaurant to exactly one. 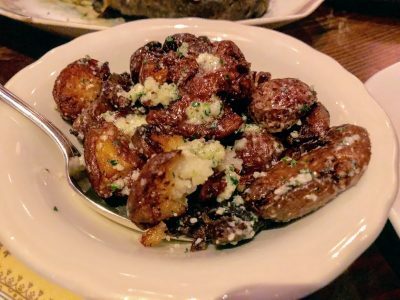 So if St. Anselm is on my list of top new restaurants for 2018, what are the others? Chloe. 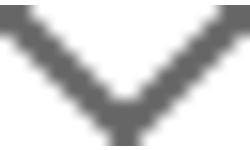 Ellē. Poca Madre. Fancy Radish (going in a few weeks but can already tell). And soon, if my prayers are answered, Call Your Mother, a new Jewish deli that’s opening on Georgia Avenue NW. My dad owned a deli in Minneapolis called Deli-ca-Chessen’s. I need a place to get my fix. DGS was good but it closed and Parkway and Attman’s just don’t cut it. Stay tuned for updates. I’ll try to give them a day or two to work out the kinks but no promises. This entry was posted in NE, Restaurants DC. Bookmark the permalink. Terrific review Rick. You characterized it right — meat-centric, farm-to-table grill in a comfortable, welcoming lived-in space. The only thing missing is something green to balance all the meat and potatoes! To Chef Meek-Bradley, how about broccolini instead of the ubiquitous Brussels sprouts? Looking forward to our next visit! Thanks for letting me steal bites of your carrot cake! Sounds great, Rick. It fascinates me to watch the local development in the 12 years I’ve worked in northeast DC. I only hope the older neighborhoods and businesses don’t get destroyed or changed forever (save A. Litteri!). I’ll probably see you at Call Your Mother soon after opening day. Thanks, Jim, it’s a date!